Until the day before yesterday I was still in two minds about visiting Osaka. People I was asking about did always answer; ‘For food it’s worth to visit. Otherwise don’t go.’, so not very promising for a person like me, who sees food only as necessary to keep the body going rather than celebrating it. I checked for hostels/hotels and said to myself; ‘If you find a bed/room below 10 EUR you go. How delighted I was, when I actually found a room with fairly good reviews for a bit less than 7 EUR. It sounded a bit too good to be honest, but as I’m relaxed when it comes to very basic living I gave it a go and booked me in for a night. I told Motoi (the Couchsurfing host from Tokyo) about it and he said ‘This hotel is by the zoo- That’s were all the Mafiosi stay. The ones with the missing finger. You know?’ I thought he was kidding, but he made it very clear that he is not. He told me he wouldn't go in that area as he thinks it’s not safe. ‘Cool’ I thought ‘It’s gonna be a great time in Osaka’. After I arrived in Osaka I got the underground to near the hotel. When coming out of the station I noticed straight away, what Motoi meant. It was dodgy looking people and tramps everywhere and I could hardly spot any women. I immediately felt insecure. Luckily I only had to cross the street to get to the hotel. Upon arrival the picture I got of Osaka did not get any better. The hotel lobby was full of dodgy looking people as well as men I assumed that where alcoholics. I checked in and went up to my room. As I opened the door I could not believe my own eyes. They gave me a prison cell! Seriously, the room was that tiny it could hardly fit the single mattress. Window and three hooks, no wardrobe, no chair, no desk, not even decoration like a nice picture or so- that was the room. No wall paper nor painting only the cold concrete. On top the window didn't shut properly, so I assumed it is going to be bloody cold in the night. Anyway, what do you expect for less than 7 EUR a night?! At least the sheets were clean. After I got over the room situation I decided to explore Osaka. I took one of the free bicycles the hotel offered and had a loop around the zoo first. 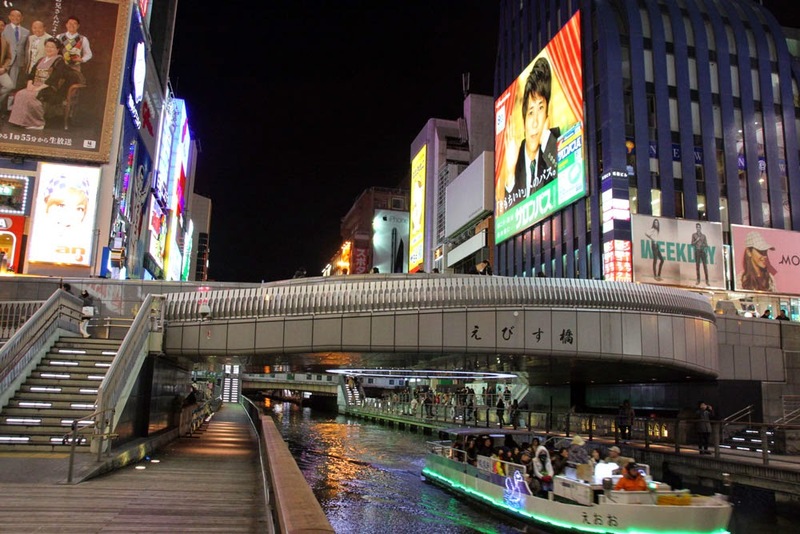 There I could find a lot of food stalls, but as I wasn’t hungry at all I decided to skip food and cycle further into town to the Dotonbori area. I now got a completely different view of Osaka. 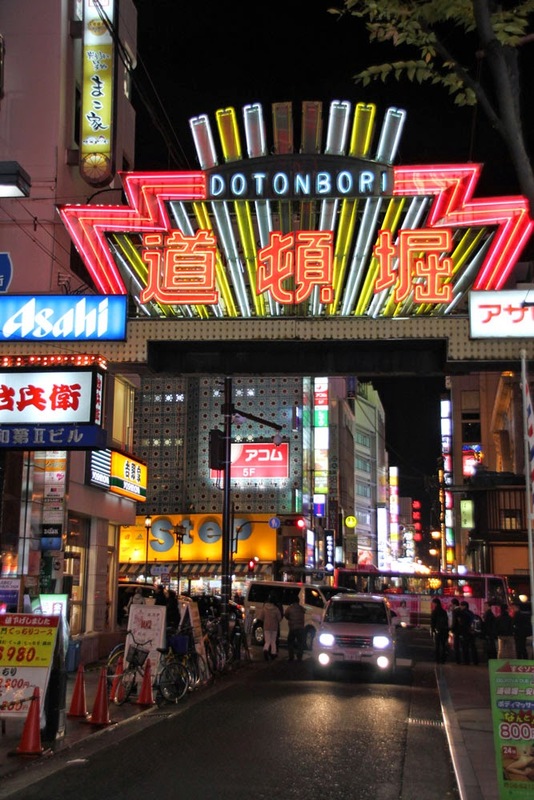 Up in Dotonbori it felt a bit like the little sister of Tokyo. 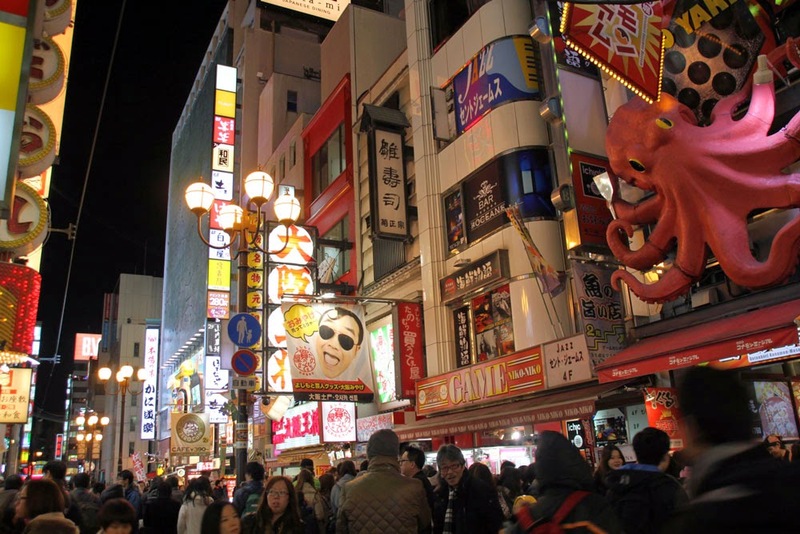 There were shopping streets with Uniqlo, H&M, Urban Outfitters and Co, lots of souvenir shops, cafés and restaurants. Also the bright billboards advertising all sorts of stuff. I locked the cycle and had a little stroll along the canal. At some point I noticed people piling up across the canal. I got curios what they might queuing up for. So I looked for a bridge to cross and went back to the point where the people did queue up. 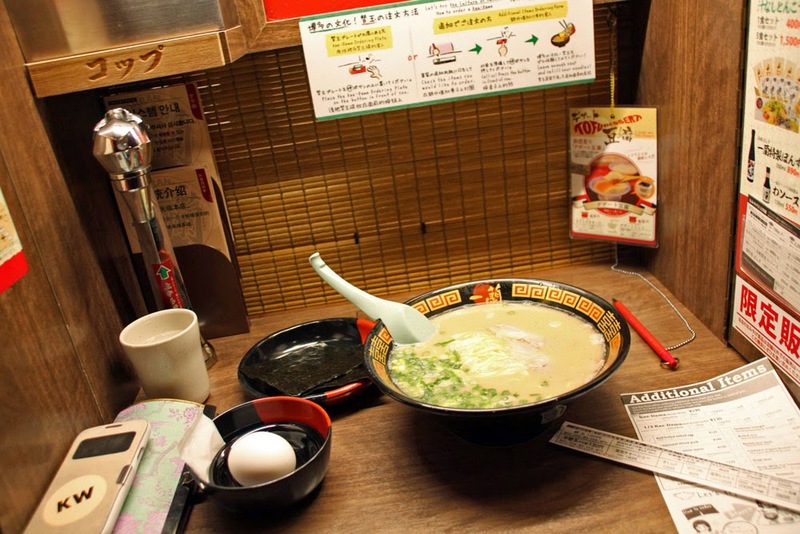 When checking the menu I found out the restaurant is one of the oldest Ramen places in town. As my stomach was rumbling anyway I decided to give the restaurant a go. Once in the line a friendly waitress approached me and asked me to fill out a sheet, where I was basically asked, how done I wanted my noodles, how rich the stock should be, how spicy I want, if I like garlic an so on. After 10 minutes of waiting it was my turn to finally leave the cold and enter the restaurant. 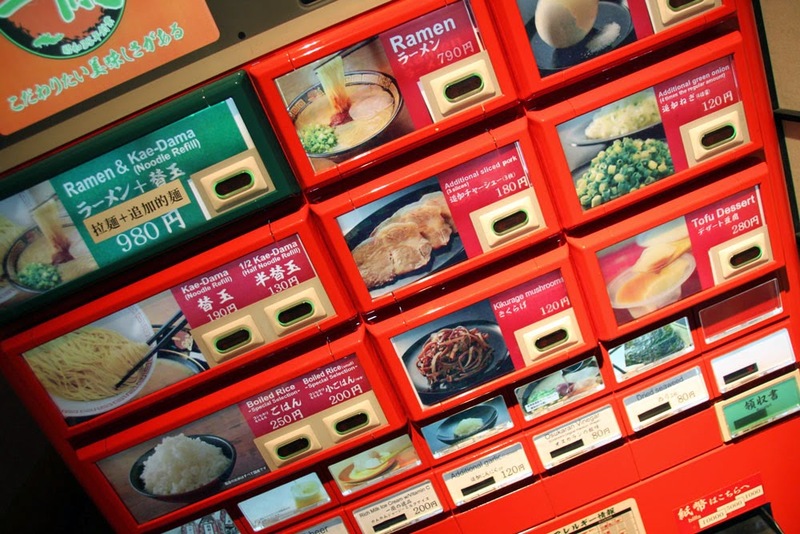 Before getting placed by the waiter I had to buy a ticket for the noodles at the vending machine. I then got placed. 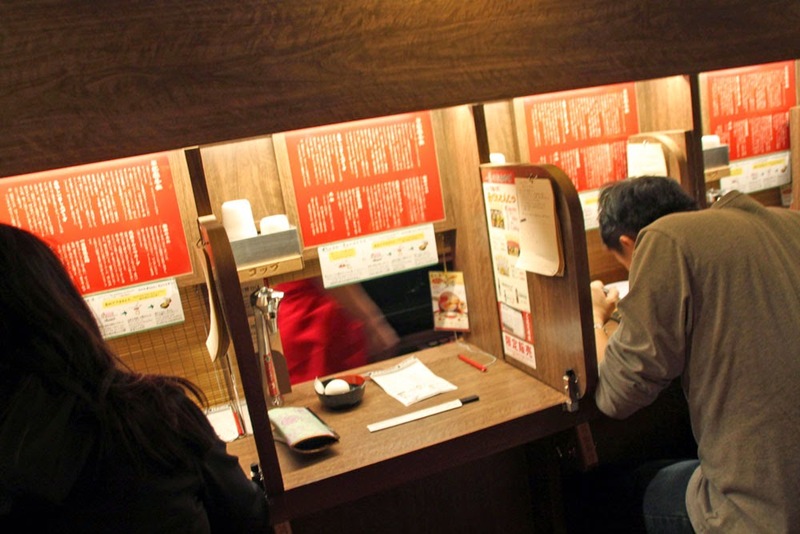 It was one of the typical Ramen places, where everyone gets their one booth. Once I sat down the bamboo shutter went up and the chef asked me for my ticket. I then handed him the ticket I got from the vending machine as well as the sheet of paper I had to fill outside and after not even five minutes got my food served. The noodles and especially the overall experience made my trip to Osaka finally worth it. I then went back to the cycle and made my way home. Back in the hotel I tried to stay in the lobby as long as possible. It was the only place within the hotel with wifi and on top of it the only warm one too. So I gathered next to the radiator and skyped with my sister. The dodgy people from when I arrived where no longer there and I actually met some really nice people. An Australian guy, who had just moved to Osaka and works as an English teacher and a Canadian, who is already travelling for over 6 years and tries to earn money by creating and selling art. Both were a lot different to me, cause they’ve already been travelling for years, however, we still had a good laugh. Around midnight I felt brave enough to go back into my ‘prison cell’ for a bit of sleep. In the end all went fine and it wasn't that bad as the blanket was doing the job and kept me warm. Now on my way to Saga where I will be flying to Shanghai tomorrow.